I had the pleasure of meeting Takeko, and we talked about many things including how she said God saved her life during the earthquake. 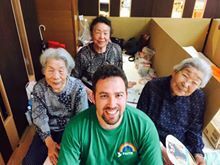 After over a month since our last effort of assisting people in Kumamoto after the devastating earthquake in April, I traveled with a team of volunteers from both Osaka and Okinawa to the epicenter of the quake in Mashiki, Kumamoto. This photo taken from the side of the road while driving to downtown Mashiki, Kumamoto. 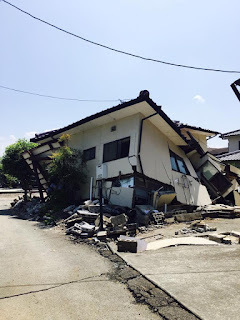 Most houses are uninhabitable and residents are scared to even return to get their things in case the house might collapse on them while they are inside. 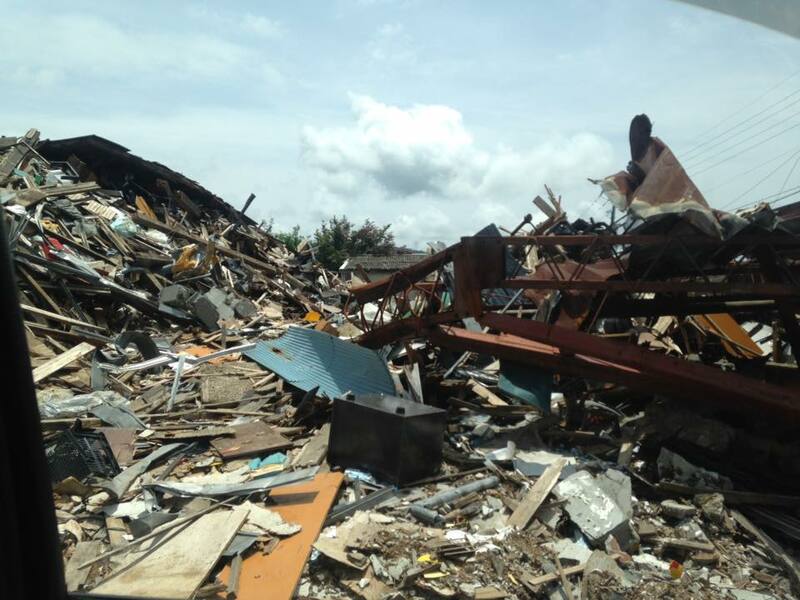 The volunteer tasks consisted of clean up of the debris which has remained for months. We had a very special opportunity to spend time with many folks who are living in shelters. These people don`t have homes to return to and sleep on cardboard boxes with a futon mat placed on top. They sleep in stalls only inches away from one another. Most of them have swollen feet and aches and pains incurred from the disaster. We first tended to their aches and pains and giving them massages and just listening to them. Many people literally began to see the swelling disappear and some even the pain simply left their bodies and they could stand up without pain in their lower back or hip etc. Some cried tears of hurt remembering all they had lost. Some cried tears of joy as they felt the love from our hearts to theirs. It was simply unforgettable. As you can see the living space is quite crowded and after months of living like this some people are really sore and in pain. This group of ladies were excited to see us and can`t wait for us to come back! Pastor Rie from God Blessings Church helping a man who had severe back pain. When she was finished he stood up walked around without pain and gave her hug. He was overjoyed! The same man as picture above, was overwhelmingly grateful! 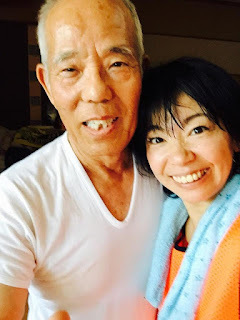 One story I will share was with a woman named Takeko (in the picture at the top). She had never met a foreigner much less had a massage from one. She kept smiling and saying it all felt like a dream to her. She said, "When the quake struck, it knocked me down flat on my back and I barely got out of the house alive before it came crashing down." She exclaimed, to my surprise "God have must have done something because I was done for." Since her stroke some years back she said it was very difficult to move and get to safety even after she managed to get out from her home. She bragged how she was the fastest runner in her class in highschool and kept saying it was a miracle that she was still here. I agreed with her. "It certainly is a miracle!" 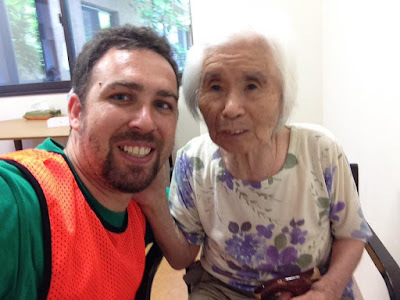 We started to talk about God and I prayed with her I saw the swelling go down in her legs and I continued to rub her legs until the swelling was gone. And she told me that was the best massage she had ever had. I said, "You are a special lady and God is looking over you." and I walked her back to the rest of the group. We ministered to over 60 people over the two days we stayed in Kumamoto. 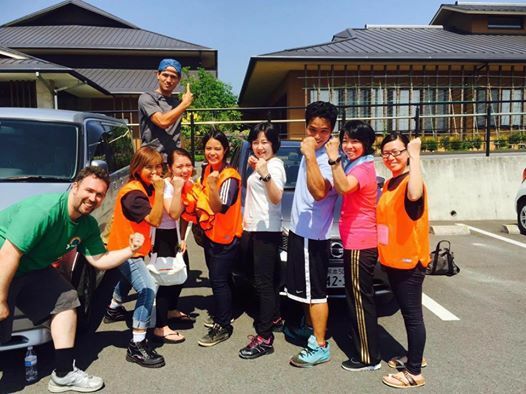 Group shot of the team on our last day in Kumamoto. And we plan to return and in the meantime we want to respond to the needs of these people by providing fresh clothes; mostly consisting of socks and underwear and even shoes. 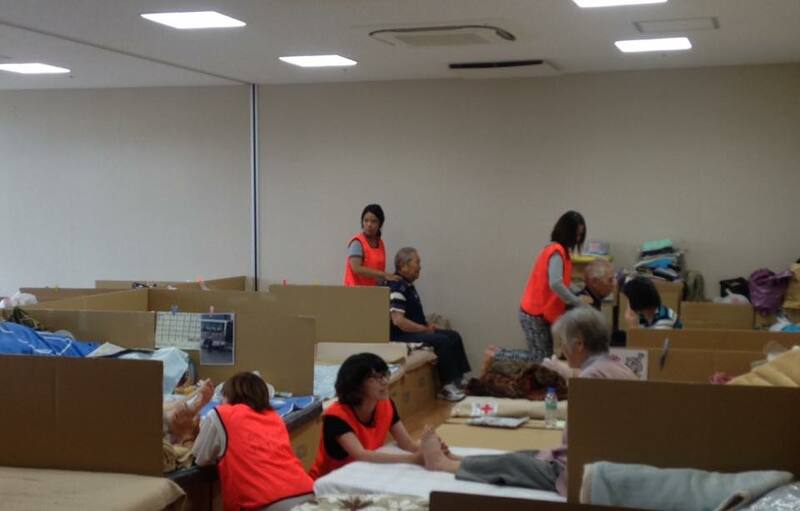 Please consider donating $50 towards supplying these people living out their days in poverty in these shelters in Kumamoto. God bless you and we plan to share more stories from Kumamoto in the days ahead.